Well, this is confusing. One minute I’m enjoying a catnap in my cell at the animal prison — or at least I would have been, if it hadn’t been for that yappy little dog they brought in yesterday — and the next minute the two-legger that always smells of wet mutt and the sandbox has brought me to this strange place. Where do I go? And more importantly… what am I going to eat? I’d rather be back at the animal prison! At least they had food there! Mutt-and-Sandbox is joined by a wrinkly two-legger, who turns and approaches me. The stranger smells of something sticky-sweet and dirt. I’m not sure what to think of her. Since she does not smell of tuna, I take that as a bad sign. Unfortunately Mutt-and-Sandbox has been eaten by the roaring black monster, which is quick to run away into the distance. Terrible thing, the roaring monsters. 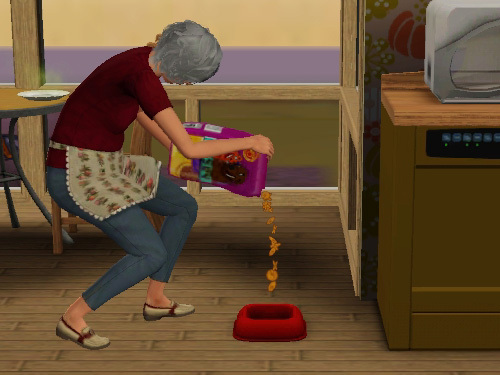 My milk-queen lost her life to one, too… Poor Mutt-and-Sandbox. He wasn’t the best two-legger, but at least he put food in my cell every day. Hey! Hey! I was just getting comfy here! The world looks entirely different from so high up! Just where is this giant wrinkly two-legger taking me? 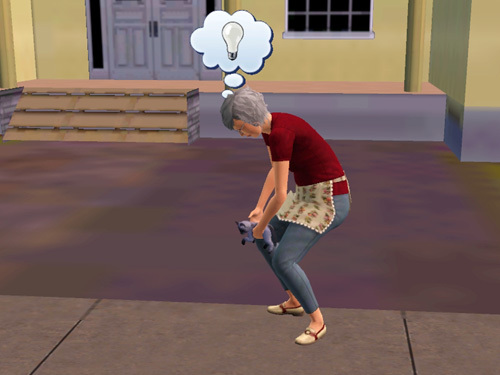 Thankfully she still knows what is most important. Food! This new territory might not be so bad after all! 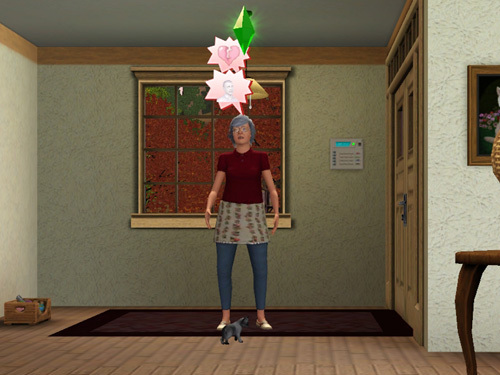 The wrinkly one leaves, and I decide to check out these new surroundings in more detail. 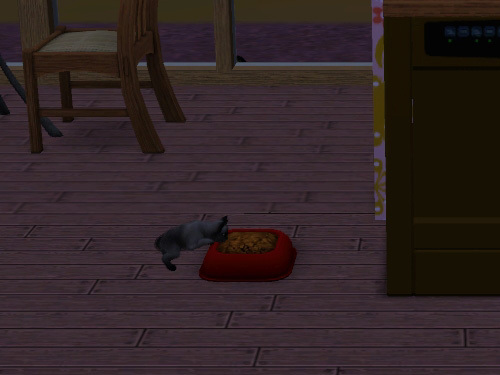 First is the food dish. It is massive, and I have to prop myself up to get to the tastiness within. I approve. Next is the light box. I do not like the light box. There are small two-leggers living inside it, and they continually make noise, like the yappy little dogs at the animal prison. I hiss at it to show my displeasure, but it continues to speak, as if to spite me. I have already made my first enemy in this new place. But wait! Is that…? It was an exceedingly busy day for a kitten. Thankfully I found a comfy spot that did not require bigger, stronger legs and leaping abilities to get a good night’s sleep, the circling underwater ruler still taunting me for my inability to paw at him gnawing at my mind in my dreams. …Yes, I think living here with the wrinkly one will do just fine. At last, I’ve gone to bed early so I get to read this! Yay! I love the sarcastic kitten voice! He has quite a bit of cattitude for being such a tiny thing, hahaha! I’m commenting again – ’cause you can’t stop me! Oh dear… now that has me thinking that my bird surely calls me, “One who always forgets to feed me.” -_-;; I’m so terrible. Thanks for stopping by my new digs, Reborn! Aww cute kitten and wonderful way of showing cat adoption from the kitten’s point-of-view. Glad she likes her new home. Will enjoy reading this story. One of my cats, Buffy sends out a big hello to your new little ball of fluff. Buffy’s sister, Muffy is much more snobby and would probably ‘hiss’ but ignore her. 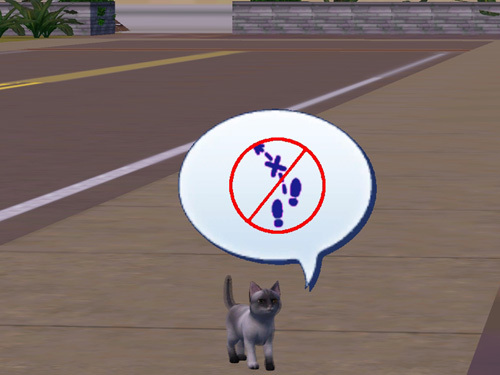 My apartment won’t allow me to have a cat in its lease, so having cats on Sims 3 has sort of been a way for me to experience that deep-rooted desire to own a cat since I can’t have one in reality at this point in my life. 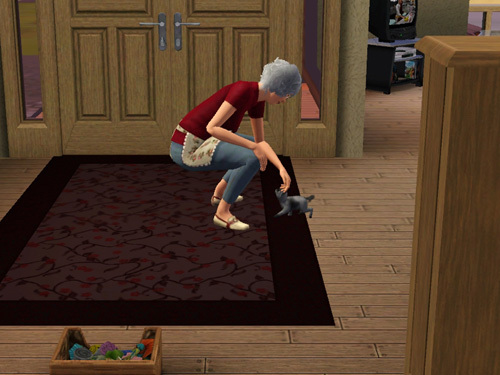 My sister has a furbaby and I was very attached to my orange-tabby of a nephew, Meekus, but after she moved out of town, my lack of cat got really bad, so I’m glad I at least have my Sim-kitties! 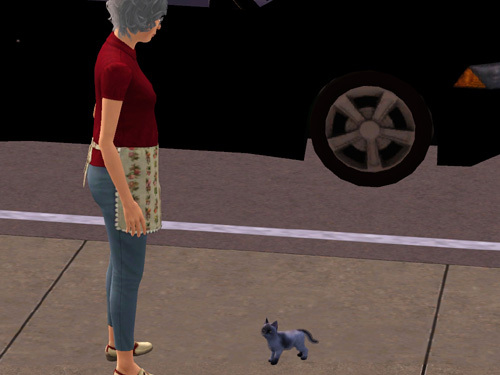 My Selfsim has a gray tabby named Casanova, as I always told myself if I could adopt a cat for myself, my preference is an adult male and that’s what I’d name him (gray just happens to be my favorite color, but when it comes to real cats, I’d hardly be so picky). He is a very proud feline. Rose had a choice between two kittens in the adoption service, and went with Shadow, who actually had the Aggressive trait, while the other kitten, Cayln (she shows up later, actually!) had the Friendly and Playful traits. I figure most folks would pick the friendly, playful kitten over the aggressive one, and felt the one with the attitude problem needed the home more because the friendly one would surely get adopted. 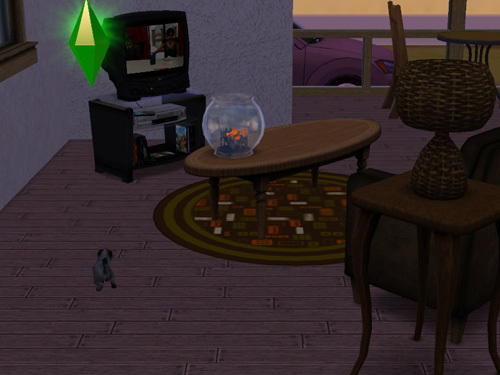 It does take him a little while to warm up, but he’s a great Sim-cat! I love your story! It’s so nice shown from a little cat perspective :) I’m going to read it all :) Please check out my blog and my story too if you like! 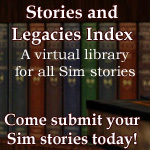 I’ve sent you an invite over the EA Sims forums to add your Sim story site to a link collective that I maintain on the forums. Indeed, every cat has their own special brand of cattitude! But that is part of what gives them their charm… and makes it so easy for them to reign over their human subjects. Cats just manage to have so much personality, despite being creatures of no words. A single look can just speak such volumes! I hope you enjoy Shadow, he has managed to be quite a character, despite (or perhaps because!) being a feline, hahaha! It’s still weird for me to go back and see him when he was so small! His attitude was just as big even when he was a kitten though, hahaha. This is adorable! I loved the cat narration, so believable, and funny too. 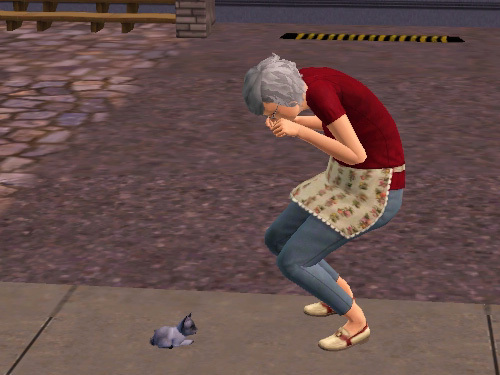 Thank you, I’ve really grown fond of that self-centered but entirely too adorable Sim-cat. Oh my gosh this is so cute. At first I was thinking.. oh wow this is a cat’s point of view?? This is so cute and original! Indeed. There are a few short stories from time to time where his Wrinkly One gets to steal the spotlight, but other than that Shadow gets to be the little diva that all cats really are, heehee. Hey! Dancer-freak from the forums here. this is so adorable, I have never thought of writing from the point of view of an animal, it is so neat and it is interesting how the little kitty perceives the world. I approve and can’t wait to see how this little guy’s live pans out. I’m a little late to the party, but I love this concept. It was amusing and heartbreaking in a way. 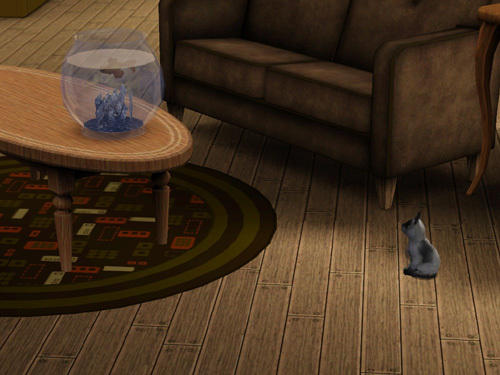 It is essentially the “cute cat picture” equivalent of a Sim story so it isn’t a very plot-heavy read, heh. 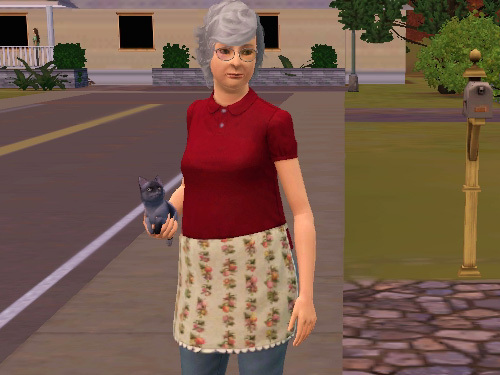 And you will have to forgive the atrocious picture quality early on as I was just learning how to use Sims 3 at the time. 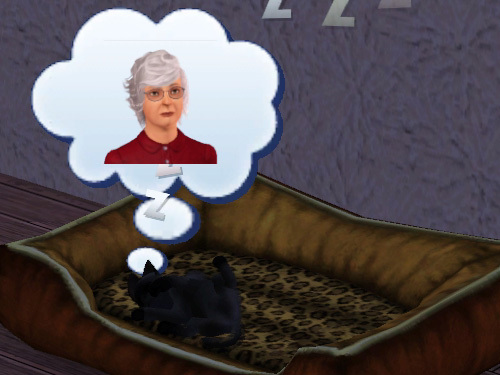 But I hope you enjoy Shadow… er… being a cat! Yay for cats! I love the narrator’s voice and the cat-perspective. It’s cute and funny and even emotional (with the mentions of loss). I think I’m going to like this story a lot! I already like it, in fact! Just be forewarned you have a lot of eyebleeding newb-player screencaps for quite a while before they improv! (Sadly nothing I can do about those since this story is 95% unposed/scripted… wasn’t even until around the Halloween episode that I even learned how to use pose mods! I was very much a new player on a journey throughout this story, heh). Those old screencaps continue to be my author’s bane whenever I go back to early chapters. ^_~ Thankfully I still get to see Shadow as a kitten, which is always a sight for sore eyes. But on the bright side, you can see your growth as a screenshotter and SimLit -writer when looking back at the early chapters. And I don’t think the screenshots are awful. You’ve captured a lot of really good moments. And the awesome narration really makes them work.